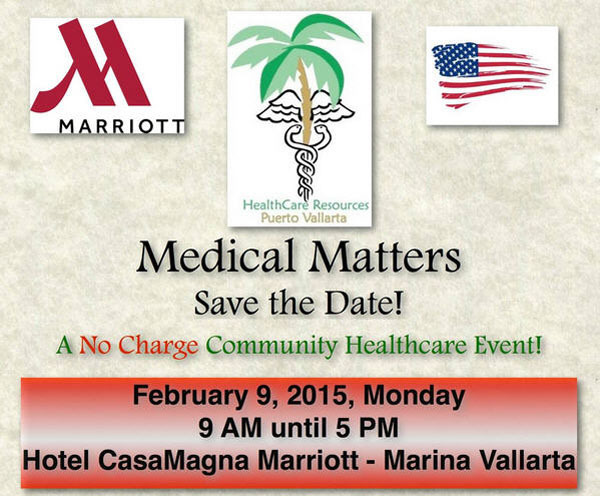 The annual Medical Matters event will return to the CasaMagna Marriott Hotel on February 9, 2015 from 9:00 am until 5:00 pm. The full day at no charge to the public to attend will include 60+ exhibits of health-related services from hospitals to insurance reps and everything in between. Non-stop speakers programs (3 rooms running this year) will be covering a wide variety of timely and interesting topics! With this great annual event "Medical Matters 2015," the city of Puerto Vallarta is also benefited by making our residents and visitors feel safe and protected when faced with medical issues or emergencies. For further information, contact Pamela Thompson by cellular at 011-322-107-7007 or by email at pamela@halthcareresourcespv.com.